11|05|12 ~ National Police Week is commemorated this week in Washington and across America. Established by a joint resolution of Congress in 1962, National Police Week pays special recognition to those law enforcement officers who have lost their lives in the line of duty for the safety and protection of others. 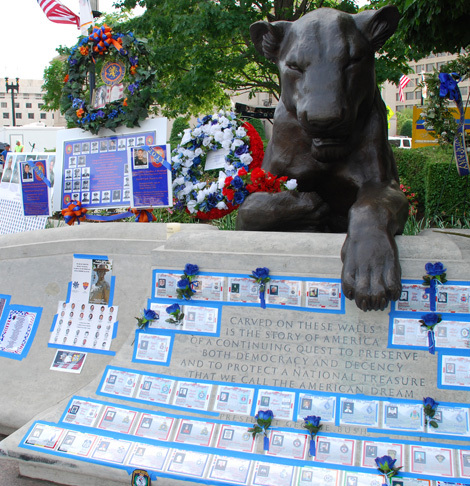 This week we recall especially Italian American law enforcement officers who made the ultimate sacrifice, as well as the family members, friends and fellow officers they left behind. Among the many heroes, we recall Lt. Joseph Petrosino, a N.Y.C. police officer and organized crime fighter who was assassinated in Palermo, Sicily, on March 12, 1909, while investigating the Mafia. Pictured above a lion guarding the entrance to the National Law Enforcement Officers Memorial in Washington, DC.